Hi guys im not sure if this is the place for this or not, but i have a question, whats the general consensus on evo conversions on lancers? like are they seen as a try hard or what ever? like im looking into a ev9 mr style kit for mine but to be honest im not sure how it would be perceived and im looking for some answers on that..
Well... The 1st rule of modifying a car is to modify the car for YOURSELF, not for others. Now that that's out of the way... I'll be honest about my feelings. IF the car's got the performance to back up the look, then sure. If not, don't do it. But back to rule #1... If you want to do it, do it. but to answerer your questions I think its one of the lamest things you can do. Last edited by Ghost-Eyes; Aug 19, 2011 at 08:32 AM. does your country have an age limit on EVOs? Australia has a Provisional License, which limits new drivers considerably. I wonder if they have less accidents because of this or not, though? OP: If I were in your shoes... I wouldn't do it. But that's just not my style. I prefer stock-ish exterior, with all my coin spent on other areas of the car. 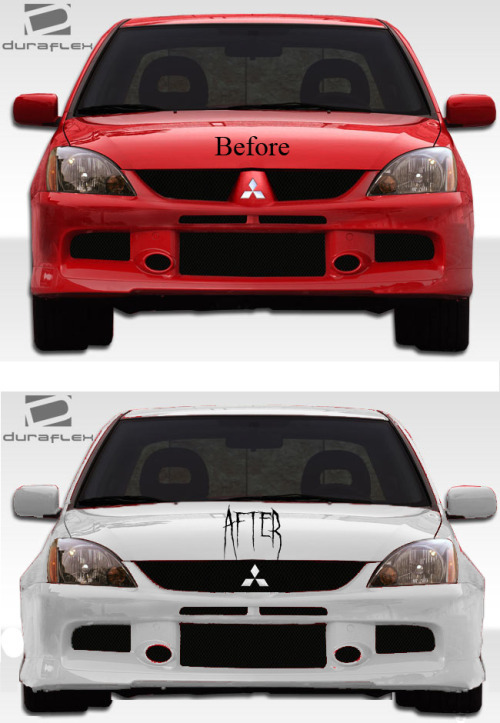 I would honestly just lower your Lancer and do some minor exterior upgrades. Save the rest for mods on the Evo when you can drive it! If you're more concerned with looking good, then go for it. The bumper + paint will probably run you about a $1000 USD. Start with the inside (most interior Evo parts are direct swappable to the Lancer), and work your way outside. I put the wing on at the very end of my 2 month build. I get flack for it sometimes, but this is my beater, so I really don't care. Have you guys heard anything about vfiber? are they any good? It is quite litterally the only half decent kit out for the lancers..